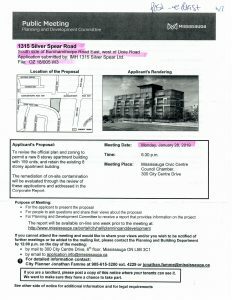 Please be advised that the above noted site plan was approved March 6, 2019 for a 12 storey rental apartment building located south of Burnhamthorpe Road East, west of Dixie Road. As part of the 2018 Business Planning and Budget, Council approved the addition of the Pedestrian Crossover Pilot Project to evaluate this new traffic control device. Under this pilot program, Transportation and Works staff intend to implement pedestrian crossovers at five different locations throughout the City. In order to select potential pedestrian crossover locations, staff reviewed more than 20 locations where additional pedestrian crossing assistance was requested by the public. The review of these locations included the level of pedestrian and vehicle traffic, the posted speed limit, the surrounding traffic control and the sight line visibility at the proposed crossing location. Winding Trail is a minor collector roadway in Ward 3 with 1 lane in each direction and a posted speed limit of 50 km/h. The recorded pedestrian volume at the crossing is 265 based on an 8 hour count while the average daily traffic is 1030 vehicles. 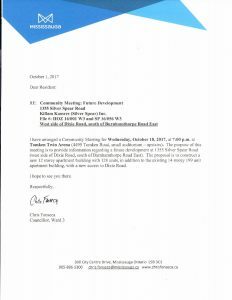 The proposed pedestrian crossover connects directly to Kennedy Park and is within the vicinity of Burnhamthorpe Public School. In addition, Traffic Safety Council recommended Winding Trail at the park pathway be reviewed for the implementation of a pedestrian crossover as a result of a site inspection completed on February 15, 2018. The recorded vehicle volumes and crossing distance (approximately 9 meters) warrants the installation of a Type D pedestrian crossover. This type of crossover includes pavement markings and roadside signs (typical layout attached). On April 27, 2018 the Ontario Ministry of Housing announced a notional allocation of approximately $13.4 million (about $2.6 million annually) to support the construction of new rental housing in Mississauga. While these funds are very limited and not enduring we are encouraged that the Province has made some effort to support the construction of new purpose built rental housing. Staff are in the process of developing a program which uses this allocation to provide a rebate for municipal and regional development charges along the lines you identified so that initial rents can be kept at more affordable levels. 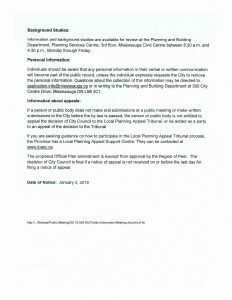 A report is scheduled to be presented at our General Committee in late June seeking endorsement to move forward with the program (assuming it survives the next Provincial election). It is anticipated that some type of Expression of Interest will be issued this summer to gauge potential take-up of the program. We will ensure that you receive more information about the program when it becomes available. Committed to setting up MioVision video surveillance in order to determine if the U-turn movements are being conducted in a safe manner. It was noted that these observations may have to be conducted in the spring, when the weather permits. Look into the current timing of the signals and volumes to determine if eastbound left turning vehicles are able to complete the movement onto Dixie Road in a timely manner. Volumes will be reviewed in order to determine if lane painting is required, option of an exclusive left turn lane with a shared thru/right turn lane will be investigated. It proved to be very beneficial to hear from the local residents last week. Without their input, the Region would not have been aware of the above noted concerns. It is hoped that the results of our analysis and data review assist in potentially improving road conditions along Dixie Road.